In a new Variety interview, Dave Stewart (b. 1952) and Annie Lennox (b. 1954) discussed their careers on the occasion of Record Store Day. One of the most interesting aspects of the interview is the nugget that Aretha Franklin (b. 1942) was concerned her duet with Eurythmics "Sisters Are Doin' It for Themselves" (1985) was ... an ode to masturbation! Variety: I read that Aretha was worried that “Sisters Are Doin’ It for Themselves” was a gay anthem. Is that true? 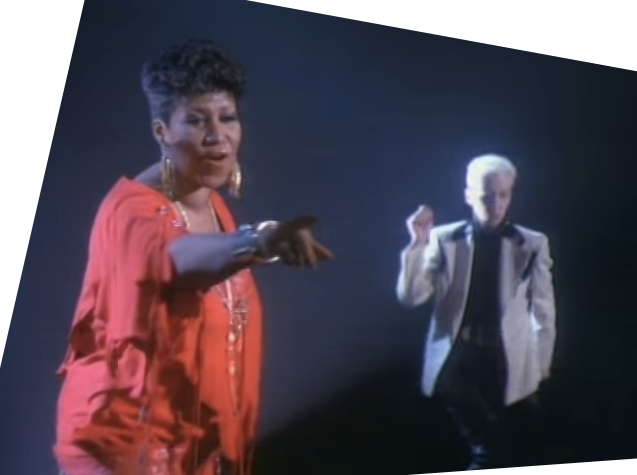 Lennox: Aretha was worried that it was a song about masturbation. I don’t blame her for asking, because as a singer, you need to understand. She had not written the song, so she wanted to understand better where the hell are we coming from. Honestly, it was not about that, so we just reassured her that there was no eroticism. It’s about sounding out their message, basically. Though it definitely works the other way?